One of New Zealand's top surgeons has operated on an ailing emperor penguin found on a beach near Wellington, some 3000 km from its Antarctic home. More used to dealing with sick humans than poorly penguins, surgeon Dr John Wyeth performed a delicate two-hour operation on the bird, nicknamed Happy Feet, which has suffered declining health since it appeared last week. But the penguin is underweight following its long swim north and has intestinal trauma, and not yet ready to be released into the wild. 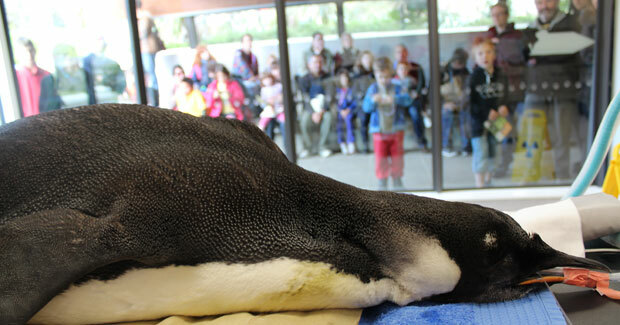 It's resting up at Wellington Zoo while wildlife experts ponder o=how to return the penguin to his chilly home. The emperor is the largest penguin species and can grow over a metre in height. The reason for Happy Feet's appearance in New Zealand remains a mystery, although experts say emperor penguins take to the open sea during the Antarctic summer and this one may have simply wandered off course.